More than two decades ago, Mike and Karen Langenderfer set out to start their own business. Through the years, the couple’s experiences steered them down various avenues, and they eventually expanded into the countertop business — opening their own shop in June 2001. 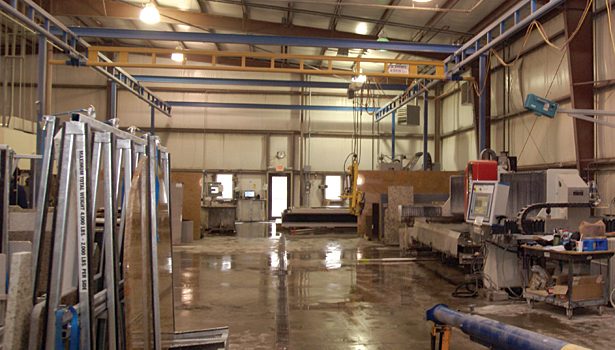 Today, they operate The Countertop Shopin Holland, OH, a stone fabrication operation which caters to the residential market and utilizes state-of-the-art digital technology. With a successful operation in place, the couple made the decision in 2003 to add stone fabrication equipment to their shop and broaden their offerings to the residential market. “The new equipment allowed us to offer several additional products which boosted our sales,” said Langenderfer. Currently, The Countertop Shop produces approximately 60,000 square feet of product per year from a single production shift. It fabricates and installs everything from laminate to granite. It offers many brands of quartz surfacing, including Caesarstone and Silestone by Cosentino. As a result, in 2010, the company switched to a LT-55 Laser Templator from Laser Products Industries of Romeoville, IL. “It is much more accurate and allows our templator to produce an actual drawing at the jobsite so the customer can see what their countertop will look like,” explained Langenderfer. “This is always helpful when explaining to the customer what an overhang or corner will look like. At the present time, the company employs seven production workers, four installers and an office staff of eight, including programmers, salespeople and a templator. “They are all employees of the company so we have better control,” said Langenderfer. “I really don’t believe in subcontracting the work. Two of the owners’ three children are integral parts of the business, according to Langenderfer. “Nick runs inside and outside sales and Melissa runs the operations of the company,” he said. While most of the company’s work is wholesale to kitchen and bath dealers, builders, remodelers and Big Box stores, it also does some light commercial jobs and a small amount of walk-in retail business. “We do 80% in stone or quartz, 15% in solid surfaces and 5% in laminate — with 50% from remodeling, 30% from light commercial and 20% from new construction,” said Langenderfer. Among some of The Countertop Shop’s recent projects are: the Davis Street Building, Lima Memorial Hospital and St. Rita’s Medical Center — all in Lima, OH; McDonald’s restaurants in over 20 Northwest Ohio locations; and Disneyland (remote projects). “We have been asked many times where we are headed in the future,” said Langenderfer. “I think I am a pretty good listener, and I only say that because that’s where we are headed. I try to listen to what the customers, my peers and the market are saying. Then we try to stay on the crest of the wave. We want to be on the leading edge by offering the newest products and innovations. As members of the Toledo Home Builders Association, Toledo Remodelers Association and the Toledo Regional Chamber of Commerce, we feel confident we have a good idea about the local market. According to Landgenderfer, The Countertop Shop’s short-term goal is to get past the down economy. “Our long-term goal for the company is to continue to be a vital part of the local business community by modestly growing the business in offering leading edge products and services to our customers,” he said.